"Birthday Pack" service to celebrate visitors' birthdays. At Tokyo Tower we wish you a happy birthday from the bottom of our hearts. 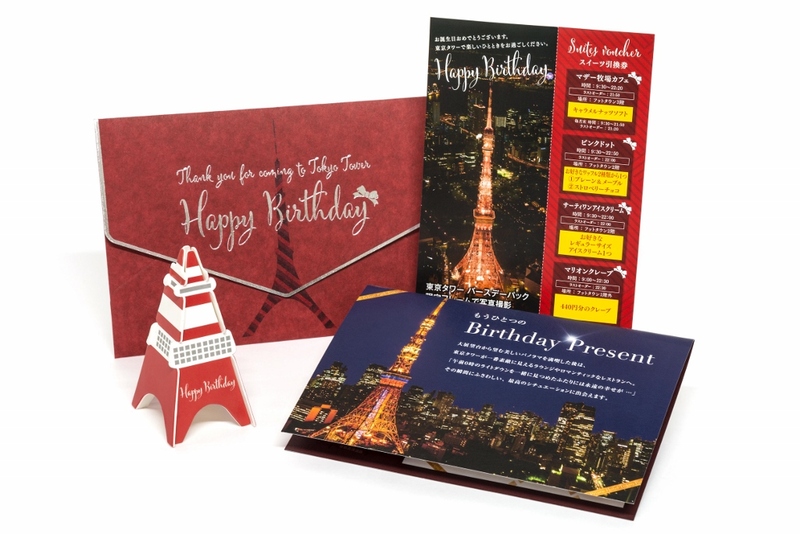 At Tokyo Tower we offer a "Birthday Pack" service to celebrate visitors' birthdays. ※ The design and specifications are subject to change without prior notice. Visitors to Main Deck(150m) who come on their birthday or one day before or after are entitled to all of the benefits listed below. We offer you one sweet of your choice from the featured products at the Tokyo Tower stores listed below. Discount service for "The Prince Park Tower Tokyo" or "Tokyo Prince Hotel"
*Please present proof of your birthday. It can be used for any one of the services at the restaurants ①～⑤ listed below. "The Prince Park Tower Tokyo"
(1) A birthday celebrant and a companion can use the 33rd floor "Sky Lounge Terrace Garden" free of charge (usually 1,080 yen per person). (2) A birthday celebrant and a companion can enjoy one drink free of charge at the 33rd floor "Restaurant Brise Verte". (3) A birthday celebrant and a companion can enjoy a 20% discount at the 1st floor "Lobby Lounge"
(4) A birthday celebrant and up to five companions can enjoy a 10% discount on the lunch buffet or dinner buffet at the 3rd floor "Porto Buffet Restaurant". (5) A birthday celebrant and a companion can enjoy a 10% discount at the 3rd floor "Cafe & Bar Tower View Terrace". *Cannot be combined with other discounts. *Cannot be used for some products. *One coupon can be used at one restaurant only. When used, it will be exchanged for this card. Have your picture taken with a frame limited to Birthday Pack users at Foot Town 3F photo service. (1 photo, 1300 yen) *You may choose to purchase the photo after it is taken. Proof of the person's birthday is required. (Driver's license, insurance card, etc.) Please present it at the ticket counter. Service is offered on the person's date of birth or one day before or after. Only valid for the birthday person. The business hours of shops offering sweets varies. Please arrive ahead of time.